“Yellow Vests” have planned action across The Netherlands to protest against “political correctness” and immigration policies, and to call for the resignation of left-liberal Prime Minister Mark Rutte. 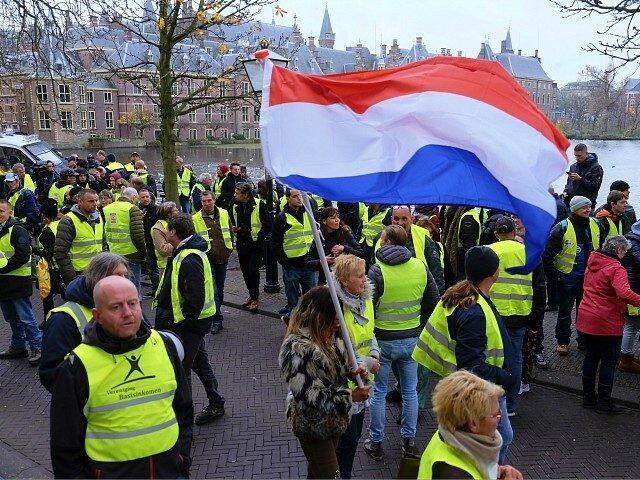 Inspired by the French Gilets Jaunes, the Dutch Gele Hesjes (Yellow Vests) will be protesting Saturday morning in Amsterdam, Rotterdam, Maastricht, Groningen, and The Hague following similar action last weekend, reports Dutch online newspaper nu.nl. Unlike the French Yellow Vests, or Yellow Jackets, whose protest originated in reaction to Paris Climate Accord-inspired green tax hikes on fuel, their Dutch counterparts began their movement over government policies including immigration and healthcare. They are also calling for a reduction in excise duties, the lowering of the age at which pensions can be received, and for the Dutch prime minister to step down, Algemeen Dagblad reports. While last weekend’s protest in Paris was marked by its violence, the ones in Maastricht, Groningen, and The Hague were said to have come off relatively peacefully, with only a few arrests. Ms Deerenberg said she hopes to lead fellow activists on a march around Stopera, Amsterdam’s city hall, singing the song “15 million people” by Dutch songwriting duo Fluitsma & Van Tijn. “Freedom of expression is under pressure, we have to be politically correct. It is a struggle,” he said. “With the demonstration, I want to show that we want a voice. It is not a demonstration derived from anger over petrol prices like in France. We are doing well in the Netherlands. “The problem is that we are no longer being heard. A lot is being decided over our heads,” the Dutch Yellow Vest added. Progressive French president Emmanuel Macron surrendered to Yellow Vest demands on Wednesday night after three weekends of mass protest, scrapping a planned further tax rise in the New Year after mass negative reaction to Prime Minister Édouard Philippe’s proposal to defer the tax for six months. However, Paris is bracing for further action slated for Saturday, with the Gilets Jaunes’ demands having expanded to other issues including education reform, social security reforms, the cost of living, and most recently the UN Migration Compact which Macron has pledged to sign in Marrakesh, Morocco, next week.